Sometimes I get these crazy ideas...! 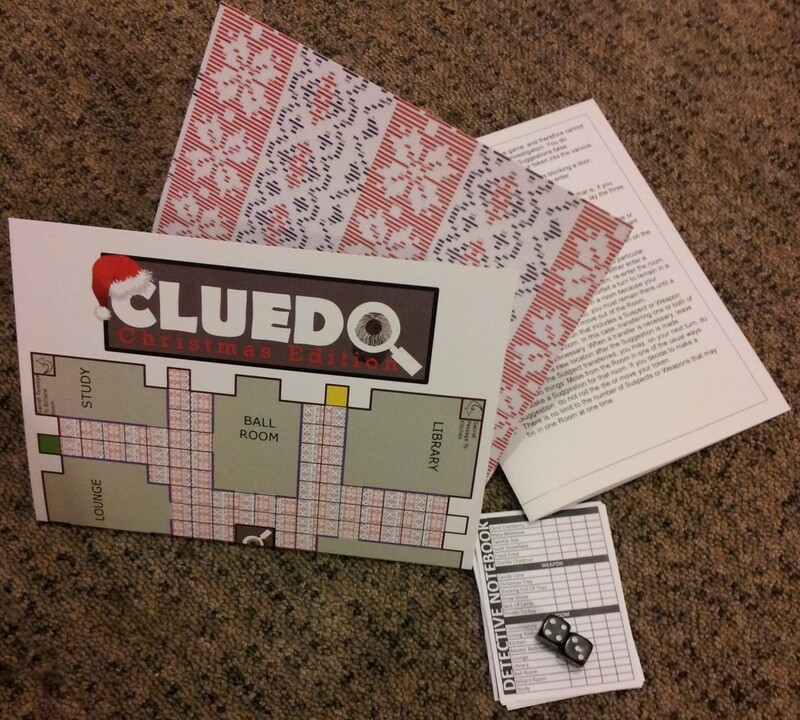 As part of my 30 Challenges I thought it would be a cool idea to design my own board game version of Cluedo AND use it as our Christmas cards this year. A playable Christmas card game - imagine that!. Of course it took far far longer than I expected to take - mainly because I have neither Adobe InDesign nor the skills to use it or any of the free alternatives! In the end the cards were designed using GIMP for images and Scribus for layout - both are awesome free/open tools although despite having used GIMP loads of times before I found both to be frustratingly fiddly, especially when dealing with getting things to align to a grid exactly. 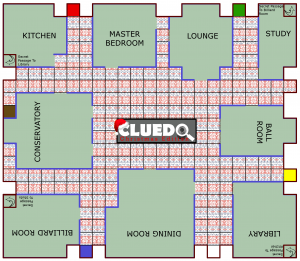 I'd expected the project to be easy - download someone else's Cluedo board vector, rename the rooms, add some colour, done! But that wasn't the case at all - I had to remake the board from scratch for a start, and then none of the other steps were quite as easy as I expected. But enough moaning... I have to say that I'm really proud of this. It was definitely a labour of love but it was a fun learning experience and it's proved that given some time (and a fair bit of Googling) I can put together something for print that isn't embarrassing, is of decent finish and is hopefully fun to play. The layout is fairly simple - board and logo on the outside of the card, message and story on the inside. Then there are 2 inserts: 1 with the rules, 1 with the playing pieces/counters/cards. (Sorry to everyone who gets the card - there's quite a lot of cutting out to do!). Also in the envelope are the detective notes and 2 dice. The final thing was printed at Edinburgh Printing (who, for the record, I didn't select based on the imagery on their website - check it out!!!!). The story itself is fairly dumb but it isn't about murder because that's not really in the festive spirit! With the nights drawing in like a huddle of penguins caught in a blizzard it’s time to put another log onto the fire and sit down for a little board game. You might recognise this one - it’s awfully similar to Cluedo! It’s Christmas eve and a local small-time thief has escaped from the police. Dressed up as Santa he has broken into Festive Heights mansion to steal the Christmas presents. The residents of Festive Heights are all at home but since the six friends are all relaxing in different rooms Bumble Black the thief cuts the power so that he can move around more easily. Amid the confusion someone knocks the thief out - but no one knows who, with what or even in which room! Just as everyone scrabbles to light candles Black comes to and runs outside... right into the handcuffs of the waiting police (who had followed his snowy footprints to the mansion). As things are beginning to settle down in the house real Santa arrives and parks his reindeer outside; Santa needs help working out who knocked out fake Santa, in which room and with what weapon so that he can give them a special reward! A note about copyright... I don't own the rights to Cludeo (obviously!) - this was just a little project for some family and friends and, as such, isn't for sale. If anyone ever wants me to design them a board game then I'd be very happy to do so!